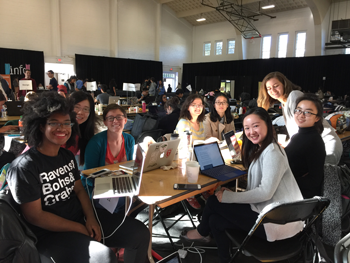 Technica, the University of Maryland’s student-run all-women hackathon, became the largest all-women hackathon in the world at this year’s annual event with more than 825 participants. Held November 5–6, 2016, women of all ages and from around the country and Canada gathered to attend various panels and workshops about programming languages, hardware, and design to create interesting and innovative hacks. Hackathons are creative, collaborative spaces where computer programmers go to brainstorm, grow their coding skills, and push the limits of technology as we know them today. While most hackathons are primarily male-dominated, Technica provides support for stronger gender diversification in technology. The male-dominated tech field can be intimidating at times; therefore, Technica provides a wonderful opportunity for women to work together, ask questions freely, and create something unique. One Technica participant noted that she has seen a greater number of women in her entry-level tech classes compared to her higher level courses, demonstrating initial curiosity in the field. With more than 275 of the participants at Technica being under the age of 18, and 50% of student participants not in STEM majors, it is clear that there is a growing, positive interest in technology. Hackers ended the event hearing from Christiana Chen, the CEO of Pathover, who gave an insight into the world of prejudice with her experiences. "As CEO of three different startups, and a former engineer, Christiana was an inspiration to all the women at the event!" says co-director Amber Mirza.